The FoVPG are pleased to announce their 2018 DOG SHOW which will take place in the Vauxhall Pleasure Gardens on 22/4/2018 at 2 pm as part of the VauxhallTrust St. George's Festival. Once again Councillor David Amos will preside the judging with assistance from local youth. Please come along with your precious pooches. Prizes and treats for all! Vauxhall Trust's celebrations for St George’s Day on the historic Vauxhall Pleasure Gardens, on the south bank of the river Thames, within a mile of Parliament are a fantastic day out for all the family. The centrepiece of the Festival will be the fourth annual London Tournament. 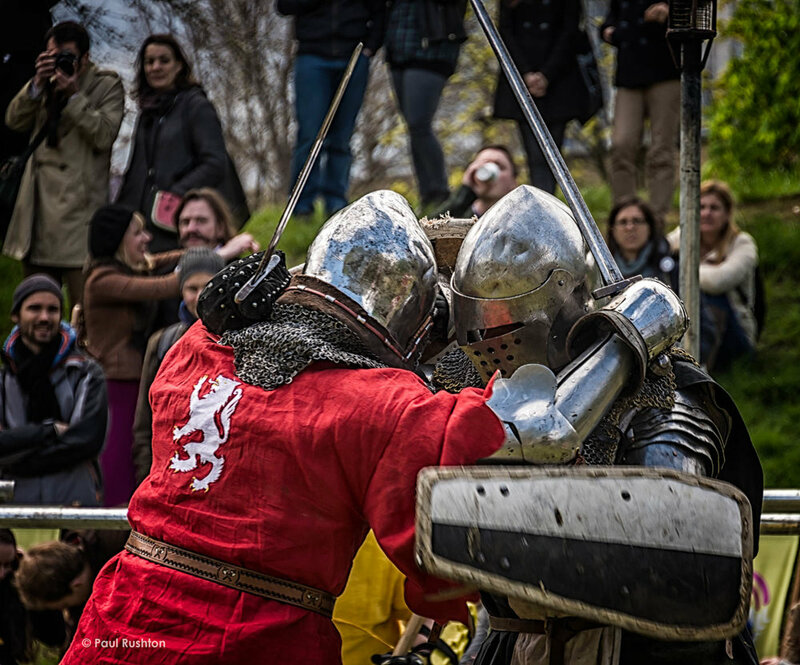 A host of international fighters from “Battle of the Nations” will congregate on the Queen Anne Field for a tourney of full contact medieval combat. Battle of the Nations hold a World Championships every year in different places around the globe. The UK team entered its first World Championships in 2013 at Aigues Mortes in France. They were followed on this trip by the BBC documentary “Knight Club”. Following last year’s festival, the British team in only their fifth World Championships came fourth in the 21 vs 21 mass battles category, beating the French on the way! While the World Championships move cities every year, we hold a Tourney in the capital of the World to augment the schedule of this exhilarating, emerging spectator sport. The London Tournament takes place on St George’s weekend as a celebration of England’s Patron Saint. Make no mistake, this is not re-enactment. There will be a full contact, armoured, singles competition where knights from around the globe will compete to be crowned the London Champion, an honour that will gain respect in all competitions for the fighter skilled enough to win. He will receive a trophy and a badge for his armour, signifying his status as London Champion in every battle he fights in the next twelve months. We will also hold the St George Melee a team competition where teams from around the world will battle it out just a fortnight before this year’s World Championships. The crowds will roar at this exciting spectacle. And do not miss the carnage of the “Meat Grinder”, where it’s every man for himself, last man standing wins. Surrounding the London Tournament will be a medieval fair with plenty to entertain the whole family. There will be Morris dancers, Punch & Judy, an ale and mead tent, falconry, archery for all the family and a hog roast, medieval folk music from Princes in the Tower, traditional crafts and an evening performance of St George and the Dragon from our wonderful troupe of fire dancers. The Friends of Vauxhall Pleasure Gardens Dog show will take place on the Sunday afternoon at 2pm, so bring your best friend for a fun day out. Judged by local councillor David Amos. We have a growing community expo as part of the festival featuring many local community organisations, the Police, Army and the Fire brigade are bringing a Fire Engine. We have representatives of a number of countries who celebrate St George. We are working with the British Georgian Society who are adding Georgian food and singers, felt craft and wine made by the oldest process in the world (8000 years). We have Russian Cossack singers and traditional ribbon crafts, Bulgarian Dancing and a host of international celebrations of St George. This is the sixth year of the St George's festival on the Vauxhall Pleasure Gardens. We have grown to take up two days, so that more traders, crafts people, performers and fighters can be involved. Come and join us, buy a wooden sword and relive a bygone era of chivalry. This is going to be the greatest show on Earth! The Vauxhall Pleasure Gardens St George’s Festival is proud to be sponsored by Tea House Theatre, Transcom Projects, The Black Dog, Vauxhall and Staybridge Suites. Please join us for our AGM , a glass of prosecco and nibbles and to discuss the future of our park! Brilliant Vauxhall is a two-day atmospheric exploration of light through the use of fire, light guided story telling with interactive installations and light projection featuring the UK’s most well respected creative organisations and the partners for Brilliant Vauxhall, Impossible Arts, PifPaf and Greenwich based Emergency Exit Arts. 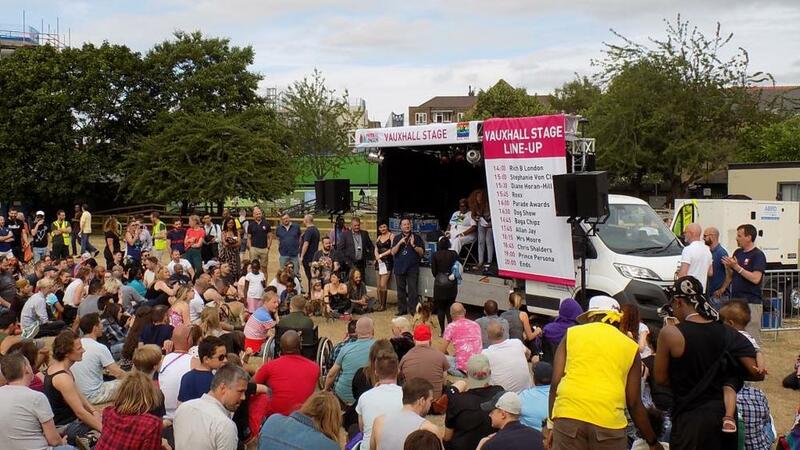 Taking place across two evenings in Vauxhall Pleasure Gardens these free events start at 5.30 pm with some food and drinks available on each evening. Brilliant Vauxhall is part of a year-round cultural programme brought to you in a partnership between Vauxhall One and Lambeth Council to make this urban oasis a go-to destination. 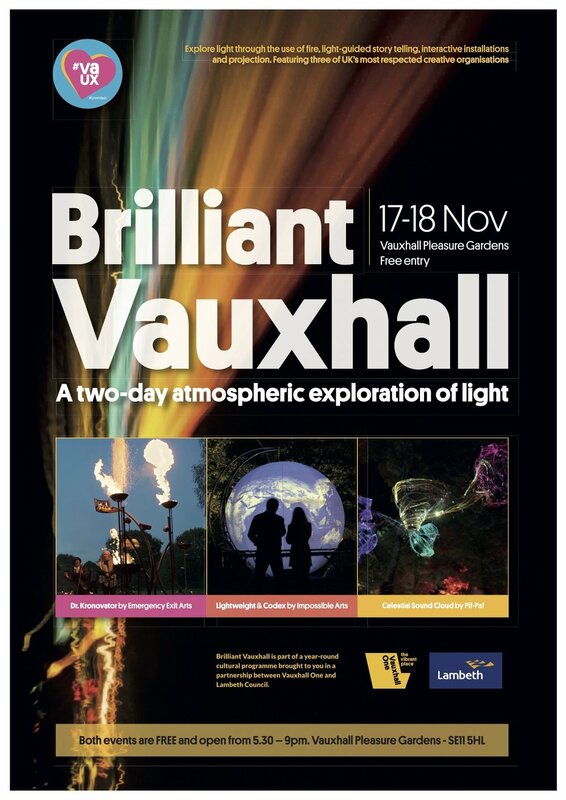 More details can be found on Facebook here Brilliant Vauxhall: Free Interactive Exploration of Light & Fire and here. Please join the Friends of Vauxhall Pleasure Gardens to celebrate their lovely addition to the park! No more flooding of the diagonal park and flowering trees every spring ! The project was commissioned and funded by the Friends , designed by Todd Longstaffe -Gowan and delivered by Landform Consultants. All will be present at the opening to answer questions and listen to comments. Hope to see you there! ENTER YOUR DOG IN THIS FUN DOG SHOW ORAGANISED BY THE FRIENDS OF VAUXHALL PLEASURE GARDENS. Registration starts at 1.30 pm for 2 pm show. Sunday 23rd April in the area between the Tea House and the Black dog pub. Prizes and rosettes for all! The St George's Festival 2017 is coming to the Vauxhall Pleasure Gardens on 22nd and 23rd April and is organised by Vauxhall Trust CIC. The centrepiece of the Festival will be the third annual London Tournament. A host of international fighters from “Battle of the Nations” will congregate on the Queen Anne Field for a tourney of full contact medieval combat. Battle of the Nations hold a World Championships every year in different places around the globe. The UK team entered its first World Championships in 2013 at Aigues Mortes in France. They were followed on this trip by the BBC documentary “Knight Club”. Following last year’s festival, the British team in only their fourth World Championships came fifth in the 21 vs 21 mass battles category, beating the French on the way! We will also hold the St George Melee a team competition where teams from around the world will battle it out just a week before this year’s World Championships. The crowds will roar at this exciting spectacle. And do not miss the carnage of the “Meat Grinder”, where it’s every man for himself, last man standing wins. Surrounding the London Tournament will be a medieval fair with plenty to entertain the whole family. There will be Morris dancers, Punch & Judy, an ale and mead tent, falconry, archery for all the family and a hog roast, traditional crafts and an evening performance of Shakespeare around the bonfire. This is the fifth year of the St George's festival on the Vauxhall Pleasure Gardens. We have grown to take up two days, so that more traders, crafts people, performers and fighters can be involved. Come and join us, buy a wooden sword and relive a bygone era of chivalry. of the Friends of Vauxhall Pleasure Gardens will take place on the 5th Of December 2016 6.30 for 7 pm at the Tea House Theatre. Please come along and have your say about new the future of our local park. We are also looking for new members and committee members, so PLEASE PUT YOUR NAME FORWARD for consideration asap and at least 7 days before the AGM! Every August bank holiday in London for the past decade, hundreds of members of the LGBT community have been flocking to the Gay Sports Day at Vauxhall Pleasure Gardens behind the Royal Vauxhall Tavern – well, this year will be no different as we witness the 10th annual Gay Sports Day take place on Monday 29th August, in support of GMFA, Vauxhall City Farm and Friends of Vauxhall Pleasure Gardens and hosted by the Royal Vauxhall Tavern. Teams of five willing contenders, often dressed in the most inventive, satirical, topical or downright outlandish costumes, from superheroes to hairy fairies (click on the photo links below for inspiration), compete in a bunch of sporting events, some of which you haven’t had to do since primary school, while others… well, register a team and see for yourself (hint: click on the ‘instructional video’ links above and below and you'll soon get the picture). Timberlina will be hosting as per usual with her … unique sense of ‘justice and fair play’, expertly assisted as ever by two of sports broadcasting's leading lights – Rugby World Cup commentator Nick Heath and TalkSPORT's Bob Ballard. Everything kicks off at 1.45pm and medals are dished out by 6pm. It’s free to attend but it’s a fundraiser so ransack your coin jars or just bring them along and empty them into the charity buckets. Register your team of five competitors by emailing michael.flaherty@gmfa.org.uk. We ask all teams to pledge to raise £500. The Big Dance Bus arrives at Vauxhall Pleasure Gardens this Saturday 30 July 12:00 – 17:00. The Ultimate Pop Up Ballroom & Ready-made Rave will rock up with its own dancefloor complete with DJ, MC, sound system to get you moving and shaking. Our resident dance company will take you on a whistle stop tour through the Dance Decades. Choreographed by Natasha Khamjani and Fleur Davison, get ready to be transported from the 20’s to the present day and see classics moves from the Charleston to Swing, Disco Fever to Vogueing, Breakdance to Garage. There will be community performances choreographed by local dance companies. You can enjoy a whole load of free dance classes in Lindy Hop, African, Bollywood and Wheelchair Street Dance. There will be something for everyone so bring the whole family and come watch, be inspired and join in on the fun! This July Vauxhall One are bringing 4 free pop-up cinema screenings to the historic Vauxhall Pleasure Gardens every Tuesday! Now in its four year Vauxhall One Summer Screen will be bringing you the best in feel good cult classics, with films ranging from classic 90’s retelling of Shakespear's The Taming of the Shrew ’10 Things I Hate About You' to John Huges’s high school classic ‘Ferris Bueller's Day Off’. There’s even a chance for you to choose the fourth and final film online. There will of course be some of London’s best street food purveyors present including Hashtag Fish who cook up some of the best fish and chips in London, not to mention the amazing salt and pepper suqid and sweet potato fries, Backstreet Diner whose burgers and handcut chips are just incredible and Maize Blaze bringing you the best in authentic fresh Colombian street food. Family oriented event held annually in the Pleasure Gardens including a picnic and live music with UK Black Pride. Pride in the Park is a community style event with all kinds of entertainment. There'll be a cake baking competition, sports events, dog show, music, performances and food and drink – all in a relaxed atmosphere that everyone is welcome to be a part of. It's the perfect way to relax with friends the day after the Pride Parade. 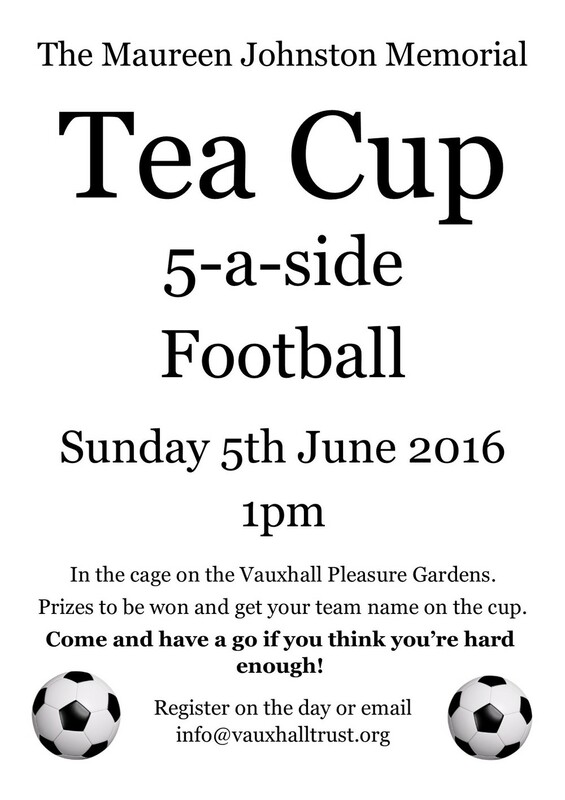 Vauxhall Trust CIC is proud to announce the next instalment of the Maureen Johnston Memorial Tea Cup. The cup is named after Maureen Johnston who worked tirelessly for many years for the community of Kennington, Oval and Vauxhall. Without her belief and support in the beginning Vauxhall Trust CIC would not have got off the ground. This will be the 12th time that local teams will be competing in “The Cage” on the Vauxhall Pleasure Gardens for the glory of having their name engraved on the cup. Vauxhall residents Goals for Glory are the reigning champions and indeed are the form team of the competition with eight victories in the tournament’s history. Year four welcomes back Battle of the Nations for the second London Tournament of full contact medieval combat. “Sharkey”, the London Champion, will defend his crown. All the usual attractions will be present, Punch and Judy, Falconry, archery (bigger and better because the queues were so long last year), Morris Dancers, the lass who did the kids races (she was great) and full contact fighting in Steel Henge (did we mention this?). A medieval market will spring up, do you want to buy a sword? go and see the blacksmith. The idea is to take orders for weaponry and have them made, each stage, the hilt, the blade, the bindings and the sheath, on the day, in front of your eyes and you can collect the finished article at the end. This can be a shield, a knife, an axe, a sword to take home with you as a piece of art. Maybe you can have your existing arms (cutlery?) cleaned and sharpened on a whetstone, an incredible opportunity to see traditional crafts at work in the heart of London. There will be fletchers, weavers, women washing clothes in traditional dress and theatre. Wooden swords and shields will be available for the kids. A giant pig will be cooked on a spit in a field, which we will then eat. There will be an ale and mead tent and we will drink. Come in costume and we will sing! Vauxhall Trust CIC has once again organised their Fire Festival. This year’s main show on the Vauxhall Pleasure Gardens on Saturday 31st October 2015 will be “The Legend of the Trickster God Loki and the Dark Elves”. The story of how Thor got his hammer. A combined arts spectacular featuring dancers, fire performers, poets, musicians and pyrotechnics told in front of the famous Vauxhall Bonfire. Get there early as it will be very busy! Visioning Vauxhall Exhibition event that is taking place on the 2nd and 3rd of October at the Vauxhall Gardens Community Centre. Since July Lambeth Council have been consulting with over 300 people in the local area to get their ideas and views on how Vauxhall could look and feel in the future. This exhibition brings all those ideas together in images and plans. As part of this event we will be offering children activities as well as free pizza and coffee to those who attend the exhibition. Lambeth parks have granted permission to park the 2 vehicles for the event on thecorner of the Pleasure Gardens. Come and have your views heard! Please come to our AGM to discuss the future of the Pleasure Gardens and other parks! The AGM for The Friends of Vauxhall Pleasure Gardens will be held on Monday 14 September at the Carmelita Centre at the corner of Vauxhall Walk and Jonathan Street. There will be drinks and nibbles available from 6.30 for a 7.00 start. If you wish to stand for the Committee contact the Friends by Monday 31 August. I am pleased to confirm that our next Ward meeting will take place at 6:30pm until 8pm on Wednesday 29th July 2015 at the Riverside Plaza, 18 Albert Embankment, London SE1 7TJ. Neighbourhood Link is a community messaging service from the Metropolitan Police Service that provides news and information about policing activity or initiatives, crime prevention advice as well as major incidents affecting your area. Once registered you can receive messages from your local Safer Neighbourhoods Team, borough police or, in the event of a major incident or event affecting the whole of London, from other Met teams. Diana Linskey (Larkhall) has kindly forwarded to me an excellent guide to signing up to Neighbourhood Link prepared by one of the officers on the Larkhall Neighbourhood Police Team. I attach this guide in pdf format. Please consider signing up yourself and please circulate it as widely as possible. Promenading returns to Vauxhall Pleasure Gardens after 160 years! Join us from midday for an exciting daytime programme of the best that Vauxhall has to offer in home grown talent! Choral world music and popular choir classics, soul, funk and jazz, music from Poldark, gypsy swing, Spanish guitar, South Connections Carnival Band and contemporary dance care of the National Theatre! Performing an open-air gala concert of popular classics by composers including Handel, Rossini, Strauss, Bizet and Prokofiev along with Last Night of the Proms favourites Rule Britannia, Land of Hope and Glory and Jerusalem. The evening will culminate with a grand finale of Tchaikovsky’s 1812 Overture with fireworks! This is a free event, so pack a picnic, come on over and visit the bar for a relaxing day’s entertainment. 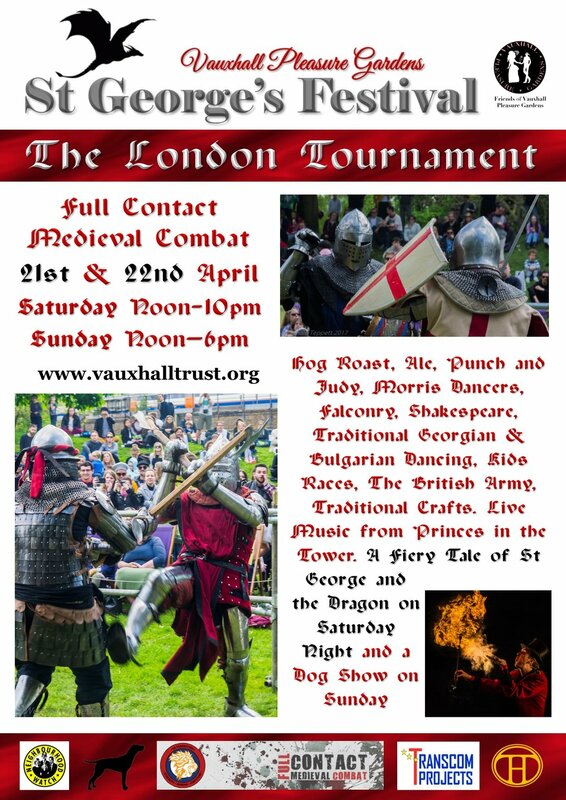 Third Annual Festival returns to Vauxhall Pleasure Gardens on Saturday 25th April 2015 with the inaugural London Tournament featuring "Battle of Nations"
Come celebrate England's Patron Saint at the third annual St. George's Festival in the Vauxhall Pleasure Gardens on the South bank of the River Thames. 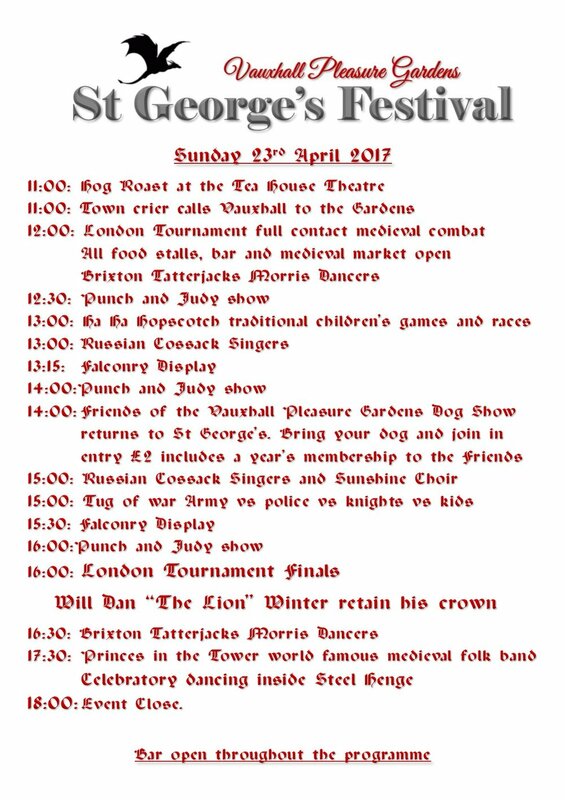 Presented by Vauxhall Trust CIC in association with the Tea House Theatre, the festivities kick off at 12 noon on Saturday 25th April. The festival plays host to the inaugural London Tournament: international fighters from “Battle of the Nations” will congregate on the Queen Anne Field for a tourney of medieval combat. In a full-contact, armoured, singles competition, knights from around the globe will compete to be crowned the first London Champion. In the Agincourt Memorial Melee, the English team takes on the French team for bragging rights in the oldest rivalry. Throughout the day, visitors will be treated to Shakespearean performances with a special focus on Henry V, Mummers Plays of St. George and the Dragon, Morris Dancers from Greensleeves Morris Men, medieval folk-rock band Princes in the Tower, and Punch & Judy puppet shows. The Falconry Centre will present a falconry demonstration, as well as daring feats of archery. This family-friendly festival also features activities "just for kids" including face painting and an interactive play area.